BLAST is one of the most powerful tools in modern biology. This collection of programs can be used to identify the origin of unidentified DNA sequences and predict the function of unknown proteins. 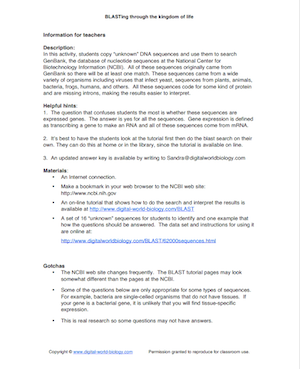 The BLAST tutorial goes through the steps involved in comparing a DNA sequence to a collection of sequences in a database and evaluating the results. This tutorial is accompanied by a set of 16 unidentified sequences from a variety of organisms ranging from viruses to humans. ​BLASTing through the kingdom of life activity (Instructions and example answers, Download pdf). New! Get an in-depth teachers guide that walks through and explains the answers for each sequence. 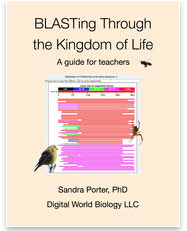 ​BLASTing Through the Kingdom of Life: A Teachers Guide is available as a PDF in our TPT store and as an interactive book on the iTunes Book store.